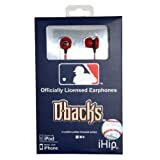 In-Ear earbuds with team logo 3D printed design, official MLB logo wire slider, and team insignia on the head jack. This entry was posted on March 23, 2012 at 3:48 pm and is filed under Arizona Diamondbacks. You can follow any responses to this entry through the RSS 2.0 feed.